It can be very frustrating to watch your mower bend the grass over rather than actually cut it. Taking it in to have the blades sharpened can be costly. This guide is about sharpening your lawn mower blades. It's easy to spot dull or damaged lawn mower blades. Instead of cutting the grass cleanly, they rip it-leaving your lawn looking brown and ragged, and even worse, more susceptible to disease. Lawn mower blades should be carefully inspected for damage every couple of weeks during the mowing season (after approximately 15 hours of use), and again before putting your machine away for the winter. If upon inspection the blade appears severely damaged (bent, badly chipped, or curled), consider replacing it completely, or taking it to a professional to see if it can be restored to a new condition. If the blade is in reasonably good shape, but just needs sharpening, you can easily do the job yourself using either a hand file or bench grinder. Before doing any maintenance work on your lawn mower, including inspecting the blade, it's important to still the engine. Start by pulling the cable off of the spark plug to prevent accidentally starting the engine. Depending on the model, the spark plug may be hidden inside the housing (consult your owner's manual). If you have an electric-start mower, remove the battery from the machine. Before turning a gas mower on its side, you may also want to empty the gas tank using a siphon hose. This should be done away from the grass and in a well-ventilated area. Remove the gas cap, inserting one end of the siphon hose into the tank all the way to the bottom, and the other end into a gas can. Pump the siphon bulb until the gas flows through the tube, and drain the tank completely. 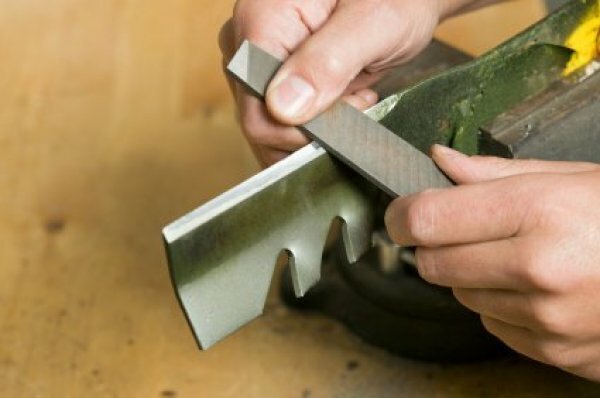 Even if you decide to have your lawn mower blades sharpened professionally, you can still save money by removing them and taking them to a shop yourself, rather than taking in your entire machine. To service the blades, rest your lawn mower on its side. 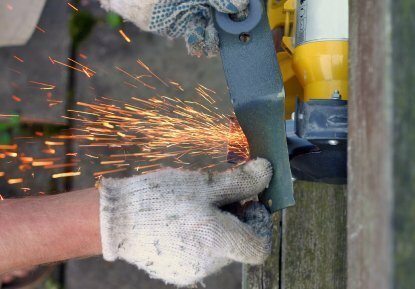 Hold one end of the blade with a gloved hand, or wedge a block of wood between the blade and the mower deck to keep the blade from turning. Use an adjustable wrench or a socket wrench to loosen the nut (or nuts) securing the blade to the main part of the mower. Remove the blade. Be sure to keep all nuts, washers, and other parts safely contained and in the correct sequence for reattachment. Scrape off any accumulated grass clippings on the blade and from under the mower deck using a putty knife and wipe it clean with a damp cloth. Hand file: Secure the blade in a bench vise grip with the beveled edge of one side facing you. Lay the file against the cutting edge, holding it at the bevel's original angle (usually 25 degrees). Push the file away from you at an angle, along the entire edge of the bevel, exerting strong pressure. Pull the file back without applying pressure (your sharpening on the forward strokes only) and repeat as necessary. When the beveled edge looks shiny, pass the file once across the flat underside to remove the burr from the edge. Sharpen the other end the same way. Be sure to sharpen both (or all) sides of the blade evenly so that it will be properly balanced when reattached. Bench grinder: Grind out nicks by running the blade back and forth perpendicular to the spinning wheel. This will give you a blunt, but straight edge. Next, hold the blade-supported by the rest place-at the angle of the existing bevel and grind the length of the blade until you get a sharp edge. An unbalanced blade will damage the mower's engine and cut grass poorly. To determine whether or not you have sharpened both sides of the blade evenly, buy an inexpensive balancing cone at a hardware store for a couple of dollars. Place the blade on the cone and check that it's balanced evenly both at rest and when spinning. If it tips heavily to one side, secure the blade in the vise (or use a bench grinder) and file it down a bit more on the heavy side to lighten it. Once the blade is sharpened and balanced, bolt it back on the mower shaft, with the beveled side toward the mower. Grease the nut(s) and screw them on tightly; replacing any with stripped threads or those that have been removed more than four or five times. How do you sharpen the blades on a riding mower? Well, for the blades on my riding mower, I remove them and sharpen them with a sanding disc on my electric drill. You could remove them and see if your local small engine shop will sharpen them for you. You must remove the deck first unless somehow you can get under the deck without killing yourself...No, never mind, remove the deck first. Remove the blades. A bench grinder will give you a sharp edge but a flat circular hand grinder will be better able to maintain that perfect cut angle. Remember, you have to make sure they are balanced before you put them back on.